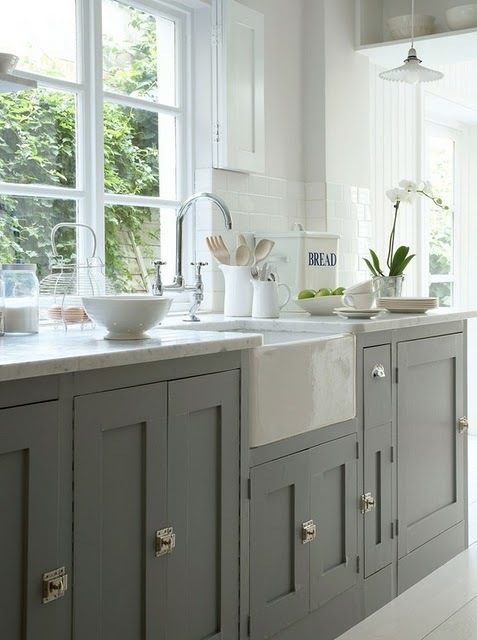 The Polished Pebble: Kitchens with Clutter...What Do We Really Want? what is that special "thing" we are all looking for right now? 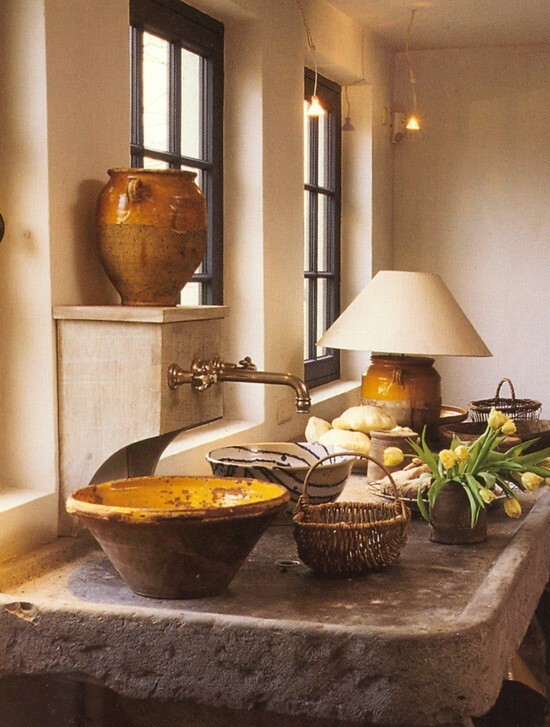 to showcase appliances and gorgeous stone? 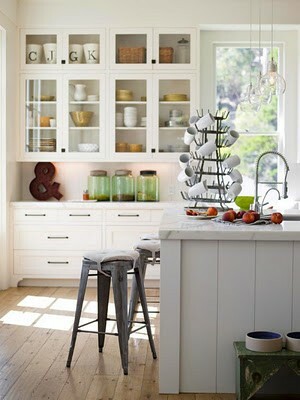 or in a freestanding cabinet? 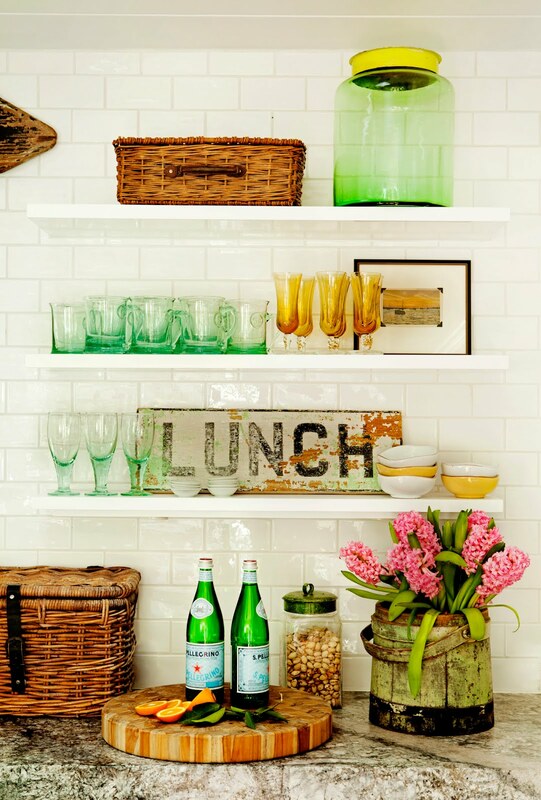 to display our dishes and glassware? is this just going to become a big dust collector? is modern, sleek and classic our choice overall? just like we have been doing for decades? 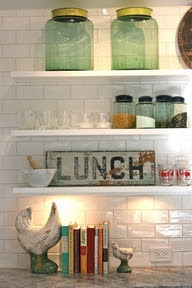 A Karin Blake kitchen...with folk art! 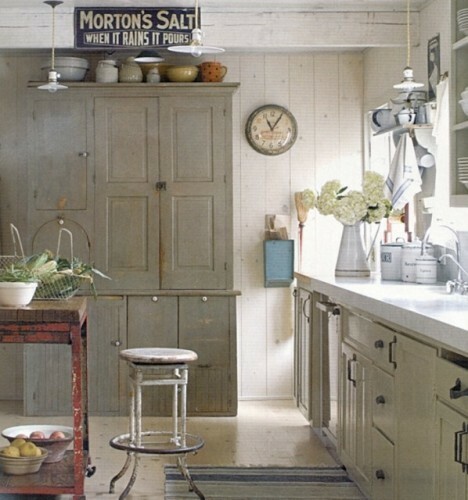 A Nancy Koepke kitchen...lots of vintage and collections and so much to look at! Meg Ryan...modern yet very warm...perhaps like the owner! 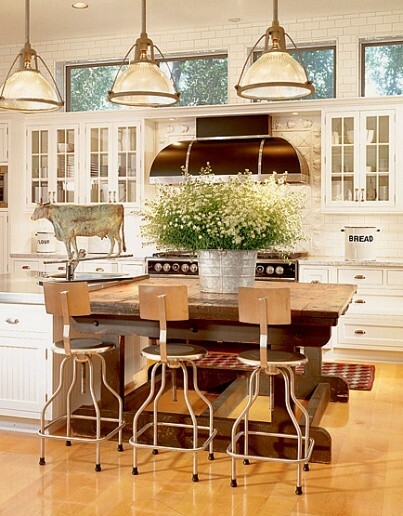 this is a modern interpretation of a country inspired kitchen...amazing! that don't really work together...why the cake and the round shell ball? 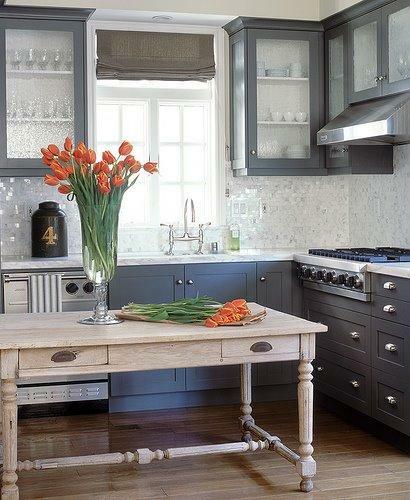 It's got a Shaw's sink for pete's sake... keep the clutter away! and I totally love the idea...it is definitely on my list of "must haves"
More unique furniture, used as an island. Heather Bullard's kitchen...this girl know what she's doing! but is it too much of the same element? 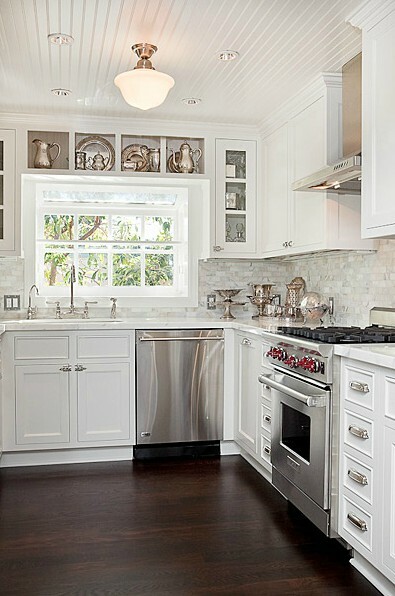 I like this kitchen a lot but I doubt this is such a great idea. I have a feeling my dog would be in there licking the batter bowls! not to mention the up keep...argh! Martha really knows how to conquer the clutter! in many magazines and on blogs. but maybe if I were living here I could work around that! I guess that's the point with great set design, right? but she just did this kitchen right! and just to make sure you have not forgotten what a real life looser kitchen looks like...this is my kitchen in Ojai, when we first purchased this house. 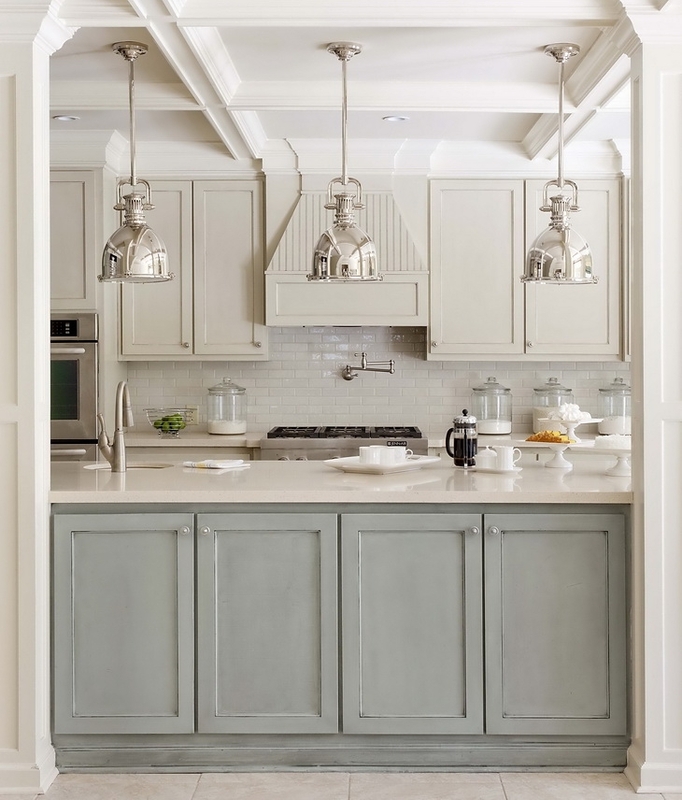 Great round up of kitchens! I think I would take the one from It's Complicated because it does look like it would work for real life. I do not care for the Veranda near the end. 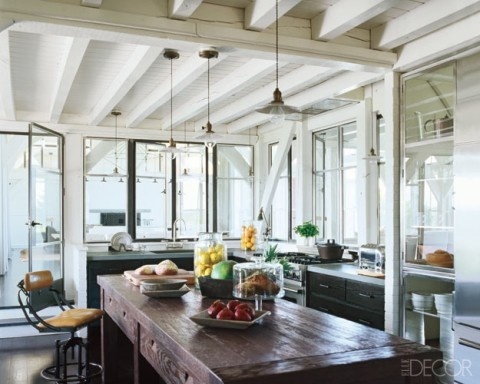 It does not look like a kitchen made for cooking..more for decorating!Just curious...what changes would you make to your beautiful former one? I just finished my kitchen remodel (a 15-month process). 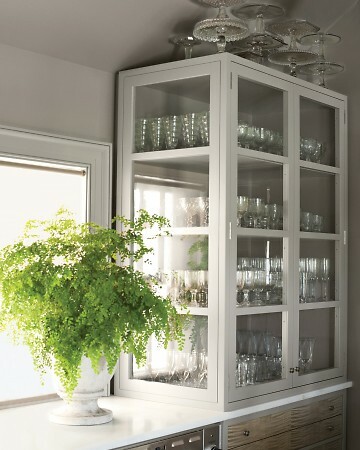 I prefer glass-fronted cabinets rather than open shelving to show off the pretties but keep the dust out. 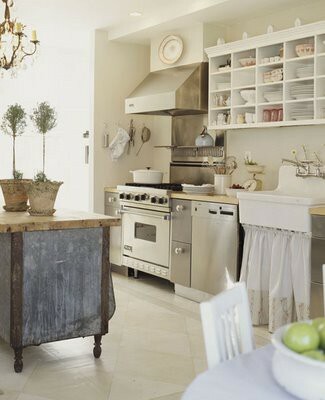 I like appliances hidden and vintage items (for me it is ironstone, hotel silver and Blue Willow) on the counters...just not too much. 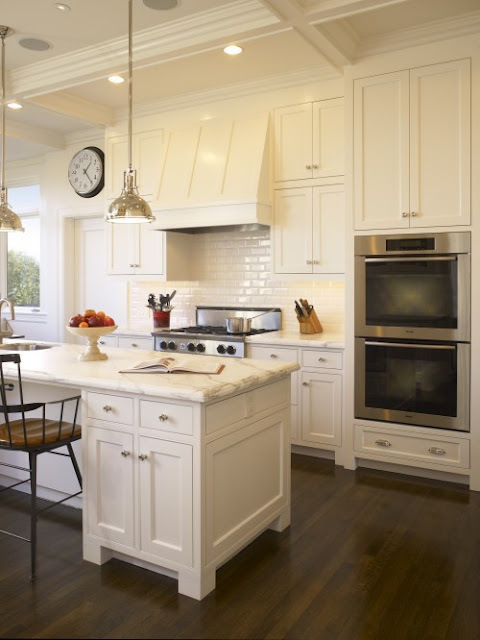 I mixed things up; a cherry island and gray-glazed cream painted wood perimeter cabinets, calcutta gold counters and backsplash throughout, a grand-scaled travertine hood and mirrored pantry with walls painted F&B Elephant's Breath. In my dotage, I decided to embrace my fancy girl. 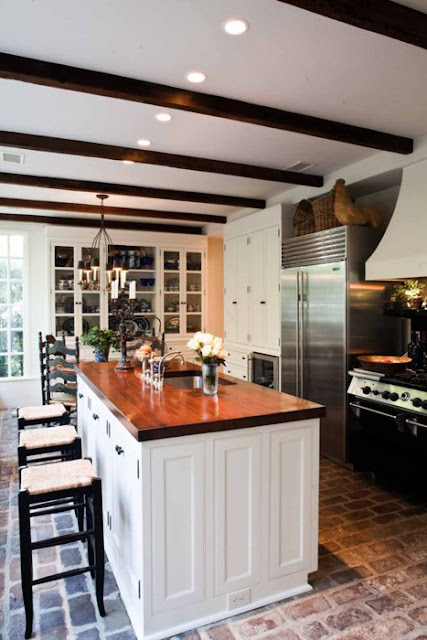 In another home, say in the country, I would love the brick floor and vintage furniture. It is so warm and welcoming. 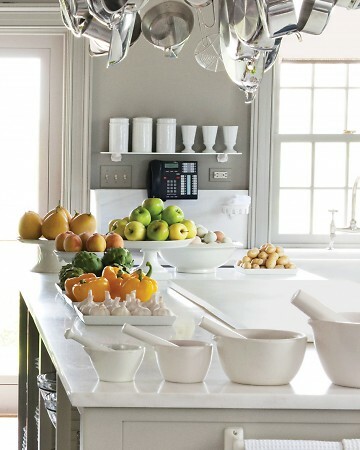 I love Jane Moore's kitchen because I am crazy for confit pots and tian bowls, but hers is not a cook's kitchen...beautiful to look at, though. 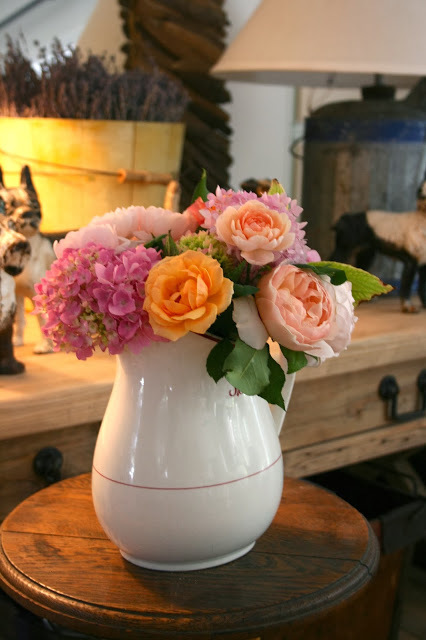 Thanks for a fabulous post and lots of pinning. 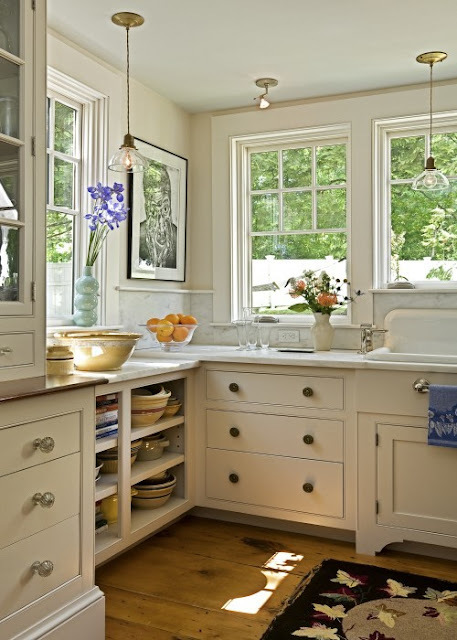 I am a no clutter kitchen person - all my small appliances, even the telephone, are inside cabinets - but I like to see some decorative elements so I have glass doors. The kitchen in the second photo, which is by Lisa Luby Ryan, is one of my all-time favorites, but with two Labs the open shelving would never work, so I would replicate the pickled wood island but with closed sides. 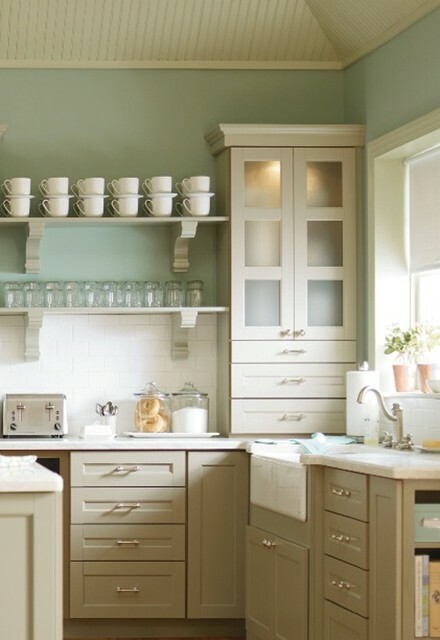 Great post, so many pretty kitchens. 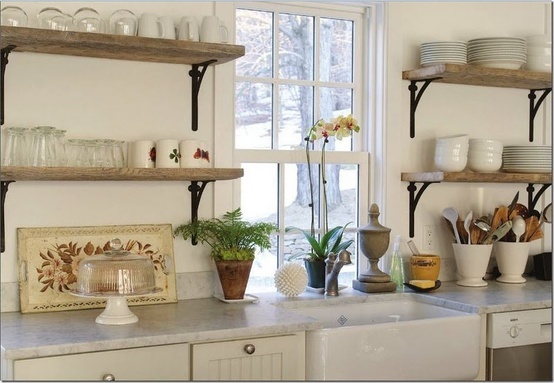 I like the look of open shelves, but since our kitchen is open to the rest of our home I think it would look to cluttered. 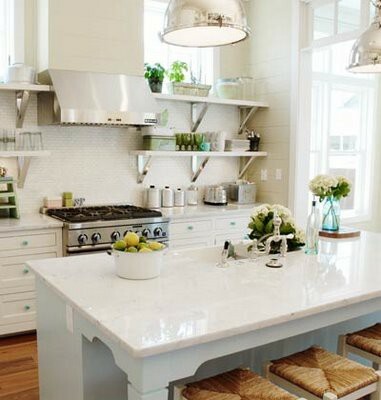 I like my counters and island clear of appliance and "stuff." My dad says it looks like nobody lives here. He prefers everything out and ready to use. That's a man for you. 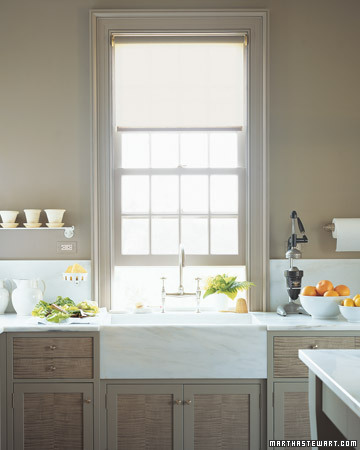 Question: what would you change about your previous kitchen? I thought it was perfect! Also, any ideas on what to do with the space above cabinets? I hate that space and would like to enclose it or something, but the budget doesn't allow for it. Breadboards maybe? So many great kitchens. I definitely like very little decorative items on counters in a kitchen, but this may be because my kitchen is very small. 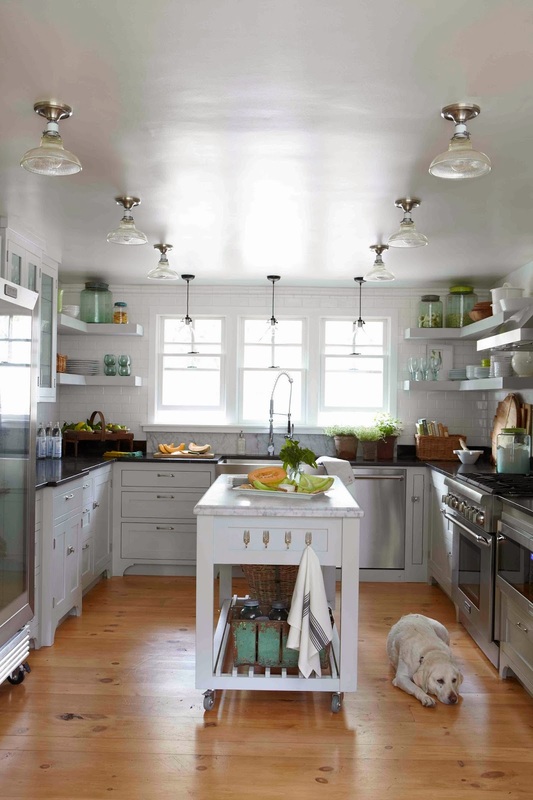 The open under cabinets seem like clutter to me and your comment about the dog is spot on, my doggies would be sniffing around for tidbits. I've had brick floors in a kitchen, murder on my legs and back, but I loved the look. I prefer my wood floors for comfort. 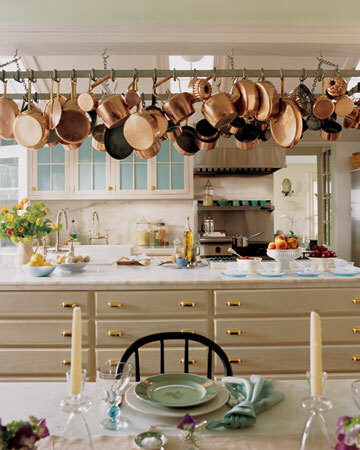 I like MS stainless pans hanging, but agree with you that the copper would be labor intensive in upkeep. 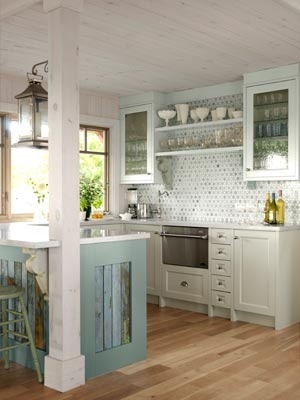 I personally love the Jane Moore kitchen, not sure I'll ever own a deconstructed kitchen but she did it well, in my opinion. 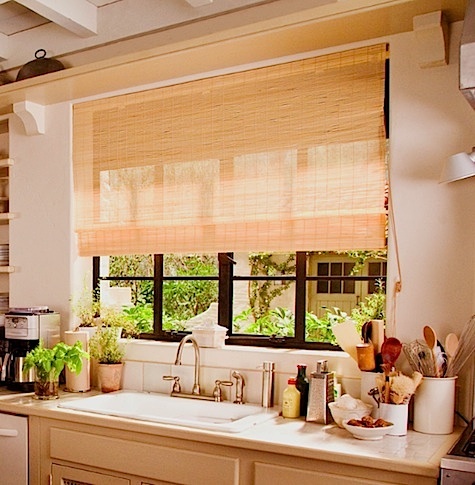 Kitchens are my favorite room to visit in the way of images. Have been visiting your amazing blog for the longest time but have never had the courage to comment until I started blogging (back in May of this year). I absolutely adore this post! Thanks for the very thorough presentation of the subject. Even though we just completed our new house in the Cretan countryside this past January, I sometimes question myself with these issues. In the end, it's Sarah Richardson, Heather Bullard, Sally Wheat and Peri Wolfman for me-new country maybe? 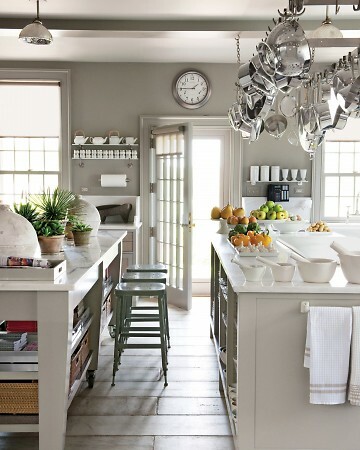 I decided to go with white for my kitchen (with French country colour pops), but I find myself being drawn to the grey lately, too, which I consider kind of modern. Ultimately, function and ergonomics need to be coupled with aesthetics and what is appealing to you. If you can get that combo right, it's heaven! Thanks again for the great post. I'm glad to be your newest follower! Hope you'll come by for a visit. Oh my dear....how I love kitchens!! I think all the styles have evolved and changed over the years because, dont we??! We go from single (and needing lots of hangout space, room for booze) to newly married (needing lots of room for all sorts of new pots/pans, cook books,etc), to having children (where the heck are alll of these kitchens tupperware storage?!) 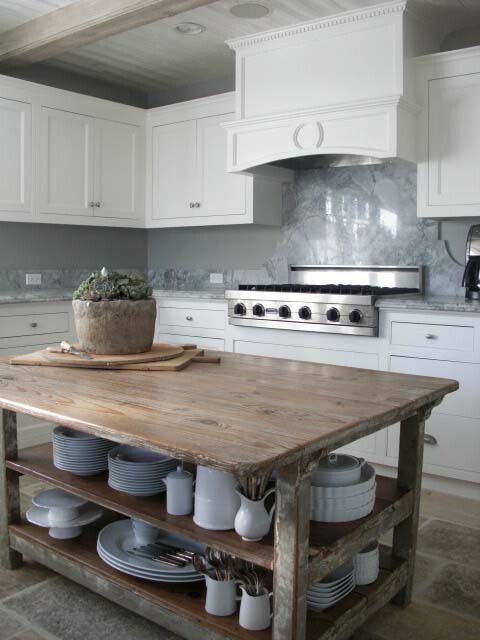 and then to having teenagers (can I squeeze one more barstool on the island, needing more convenient, easy to clean surfaces!). I think the kitchen/dining areas are the MOST ever-changing rooms in the house do to the constant changing life we all lead. 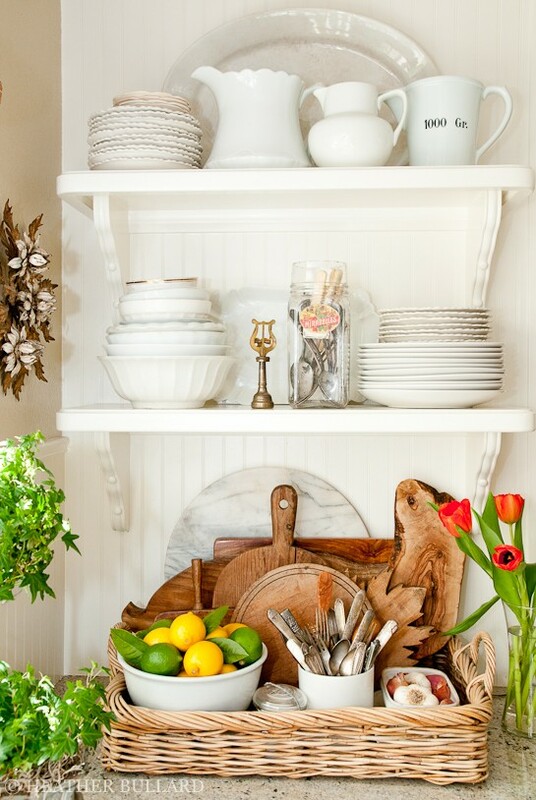 I love a little clutter, but it also has to be functional and organized, not just for looks. I also love the brick floors. I want to take out my dark walnut wood floors and put in the thin brick that I used in my front room. All you have to do is sweep them and they don't show a thing! Great line-up and wonderful observations on your part. Loved this post, thanks for all your hard work pulling it all together for us! Love all the inspiration shots... wow! I think moderation is always the best way to go. Why would anyone want ALL open shelving or ALL closed up spaces? I love having a few open shelves to show things off or for everyday items, but I would never want to have everything on display. I also think having all closed doors makes a space feel unlived in. 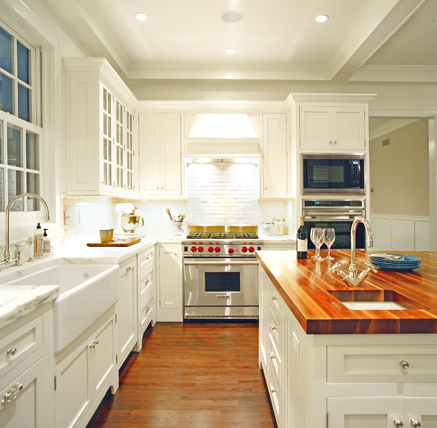 Gorgeous kitchens, all of em. Cheers! Great post Kelly, I wish I could owned 4 houses and could design each house with a different style. There are so many styles I like and couldn't put all of them in one design. 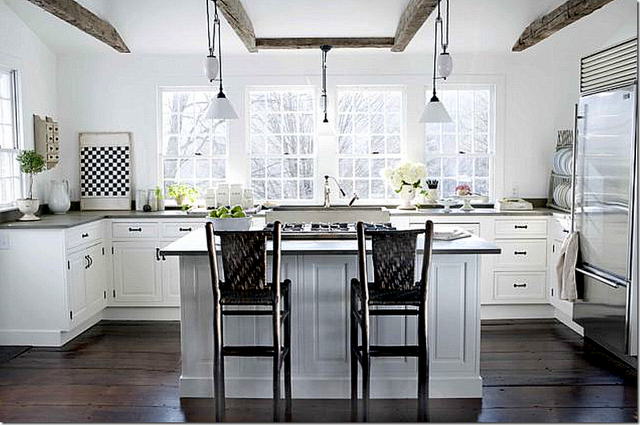 What a GREAT collection of kitchens!! I kept saying YES~That one...until I saw the next! Always loved your kitchen....and would give an eyetooth, and maybe evena kidney for some of those great green cannisters you have! 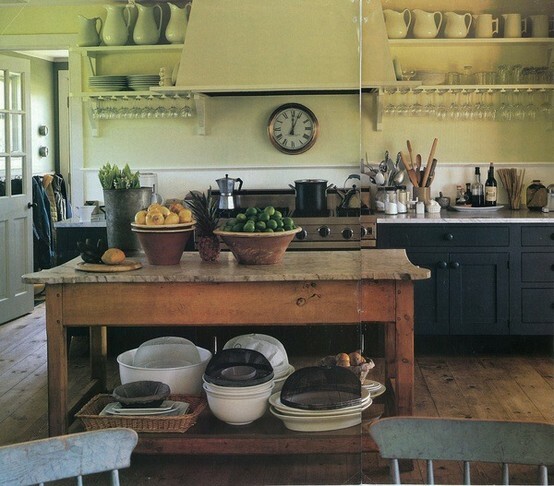 One of my favorite kitchen shots of all time is of your old house with the open shelving and those big green jars on them. 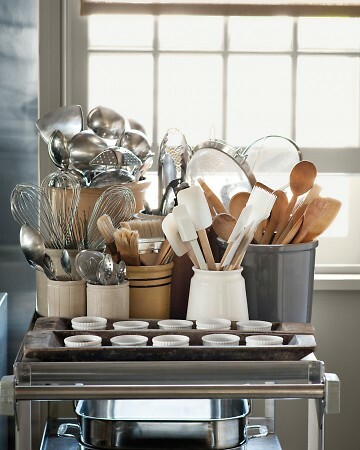 *Organized* kitchen clutter at its best! Seriously, I still refer to that shot, and the one of the bathroom with the postcards. 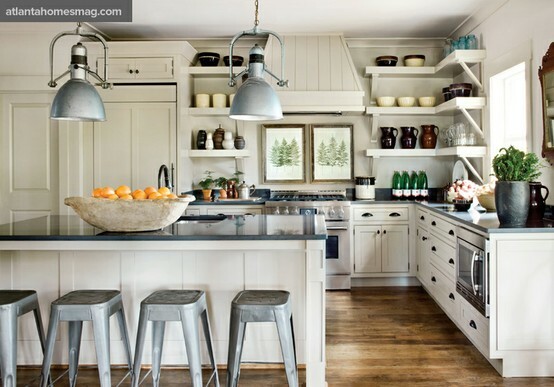 Kelley...YOU ARE SO FUNNY..."don't call me..." I am in Mammoth right now with our TINY but well equipped kitchen...stuff is spilling out on the counters....no room. 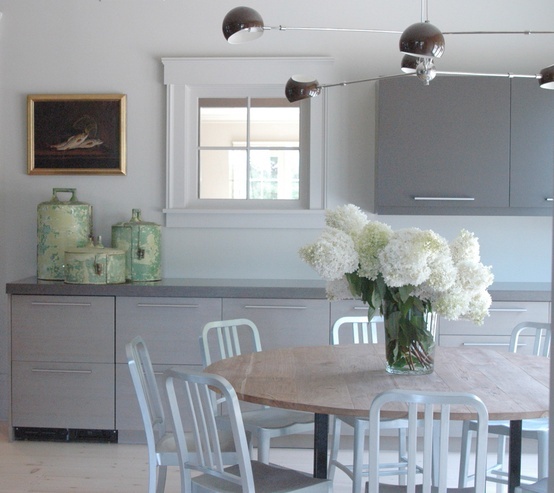 At least in Newport we are sort of organized...but both kitchens are happy places. i LOVED this post and read it so slowly. Great post! 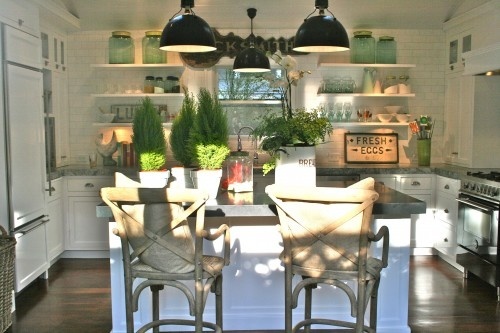 I personally do not like too much clutter on the counter. 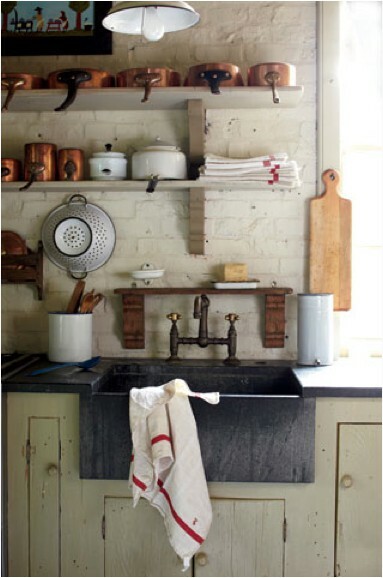 I do like to see elements that people actually use that still look attractive ie utensils in an old pot etc. I do not like to see coffee makers, toasters or the like on one's counter. 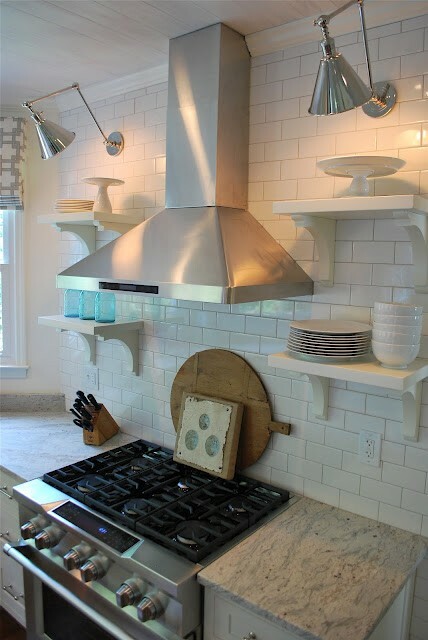 I love the idea of open shelves on the top but I am not very tidy...so I always worry about the dust! I would never have open shelves on the bottom...Bobo would be licking them as well. And as a side note...can't wait to see your new kitchen (hopefully in a shelter mag), and your old kitchen still looks fab! This post is just great I keep going back to look. 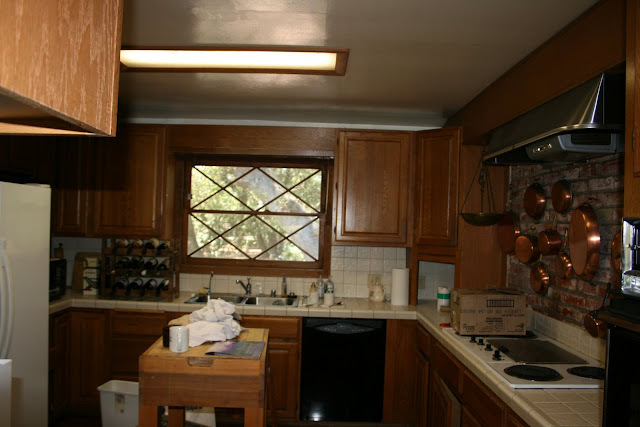 I am itching to get started on my own kitchen after looking through all these photos. Any tips on a good open shelf to use? It seems like weight might be an issue. This was a great post. 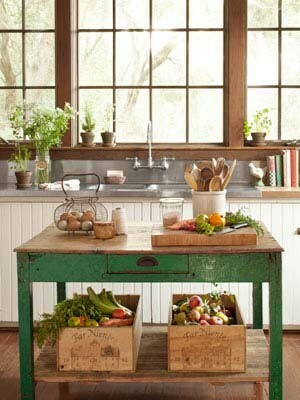 I've decided if you really cook, you will have clutter! I just redid a kitchen in a farmhouse that we took down to the studs. I wanted white cabinets but my husband wanted red since its a farmhouse. I now love them just because they aren't the same as everyone elses. 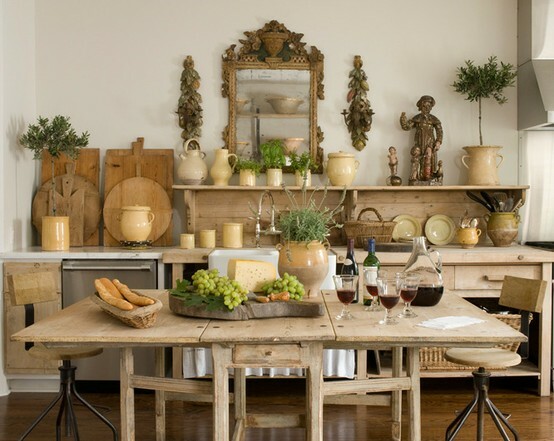 i have to say i ADORE your old kitchen! it really stands out with all the greens. i love it and wouldn't change a thing! also, i did love that first picture. a lot. and tons more. 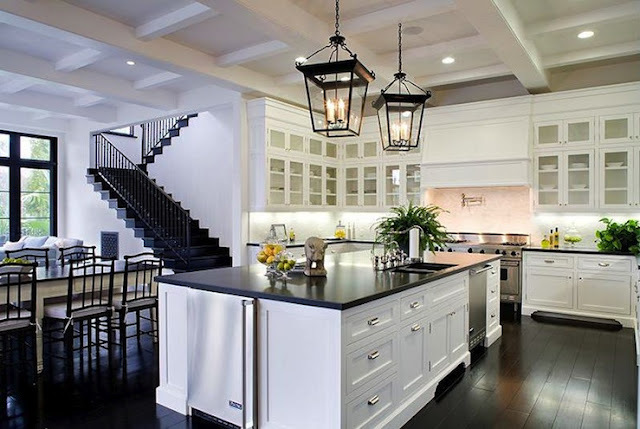 That's a an awesome kitchen. Its spacious and can bake more bread and heat meat. 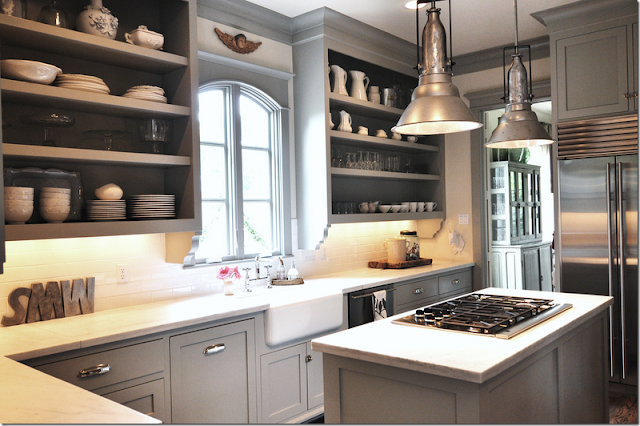 What a collection of kitchens! Fabulous post. They are all spectacular. Fun to look at all of them at once like that. Love it. This post came at a perfect time, as we had a hot water leak and the kitchen was torn out. I am still trying to decide what I like and this gave me many great ideas. Thank you, honestly 2 months+ with no kitchen starts to get very old with no end in site. This is a very special blog. Effective, clean and nice educational blogs. I will be coming here back in a bit, thanks for the great blog. They all look great as a photo shoot, but so many of them look totally unusable. 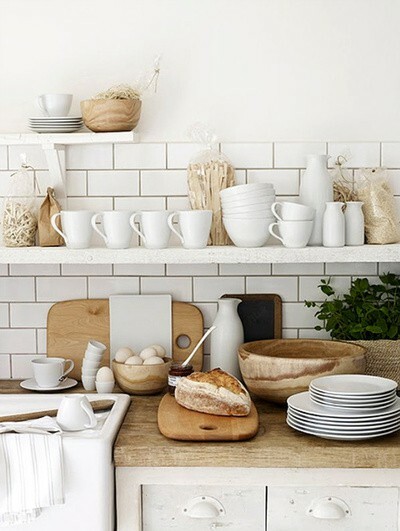 Because I have so much kitchen stuff that I actually use, I have no desire to clutter it up with bric-a-brac that merely looks interesting. The Peri Wolfman kitchen, for example: The repetitive pitchers look cool, but why would somebody need that many identical pitchers?